Reddit has grown in popularity over the past few years. You basically find intriguing answers to anything on this website. But mostly you surf Reddit on the PC. What if you can have a seamless Reddit experience on your iPhone? Well, now you can, because we’ve compiled a list of the best 5 Reddit clients for iPhone owners. This is a robust Reddit client that has all the essentials to browse the Reddit community. It works fast and has an easy switch between Night and Day modes for easy reading. Users also get Touch ID lock, passcode, changing font sizes and text, clear cache, remove thresholds, and limit cellular downloads as low as 200kb so that you don’t consume precious data. It is free to download while Pro Upgrade costs $2.99. Download from App Store using this link. Redditors can enjoy customizable browsing and a rich feed with this app. And with a few taps, you can get into the galleries submitted in a subreddit without any distractions. However, you need to pay $2 for unlocking night mode, meta data control and media view. However, it is still a decent app if you use it for free. Download Beam from App Store using this link. This is still in beta and was developed by @JPEGuin (Twitter), a Redditor named Shihab Mehboob. It is expected to come out of beta by spring. It has a minimalistic design, fluid animations, themes, layouts, fonts, etc. iPhone 6s/6 users get a 3D Touch Menu that takes them to the Main Menu, Front Page, or their own profile on Reddit. The beta is free to sign up. The creator of this app is Awkward BV aka @beamreddit on Twitter. The app, by default, opens with a cool dark theme, but users can select from 5 different “depths” in Settings. Reddit can be reached by tapping through the menu at the screen’s button. The same can be done to reach inbox, settings, starred items, without stretching fingers. You need to spend $1.99 to use this Reddit client. Download it using this App Store link. This is a quite minimal app which doesn’t include any in-app purchases. Moreover, it has options for night and day modes for which payment may be needed if used in other apps. Mars is free to download and is ideal for those who are not big fans of Alien Blue. Download Monochrome Reddit client app from App store. 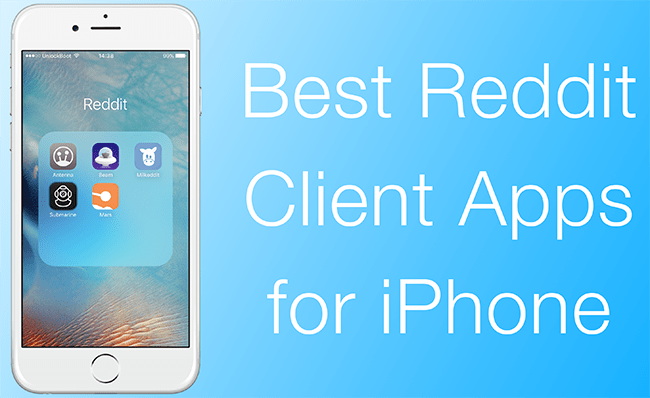 These are the 5 best Reddit client apps available today for iPhone users. Did we miss out on your favorite one? If yes, feel free to share its name in the comments section.